What is Your Dog Telling You with Its Eyes? Human beings express a range of emotions using various physical movements and expressions. As a human, you can show your happiness with a smile, or express your displeasure by frowning. You can take a tall, stiff stance with your body to display aggression, or reveal disbelief by rolling your eyes. Although it may be hard to believe, your dog possesses many of the same skills when it comes to communicating without language. Dogs will bark to express excitement, nervousness, or anger, and can also use body language to communicate. However, did you realize that your dog can also use its eyes to communicate with you? It is already well-known that wolves and dogs are social animals that rely on a pack to live a mentally healthy, happy lifestyle. Living in a pack requires various forms of communication, from tail wags and barks to general body language. A team of scientists from Japan has recently discovered that canines may also use their eyes to communicate with one another. The team found that wild canines (gray wolves, fennec foxes, and bush dogs) all gazed at each other with the same frequency, but that gray wolves held their gaze for much longer periods of time. Gray wolves even used various gazes to differentiate between play and aggression. Canines, such as wolves, have a higher level of contrast in their eyes and are likely to rely on that contrast to determine what other dogs (and people) are looking at while gazing around their environment. 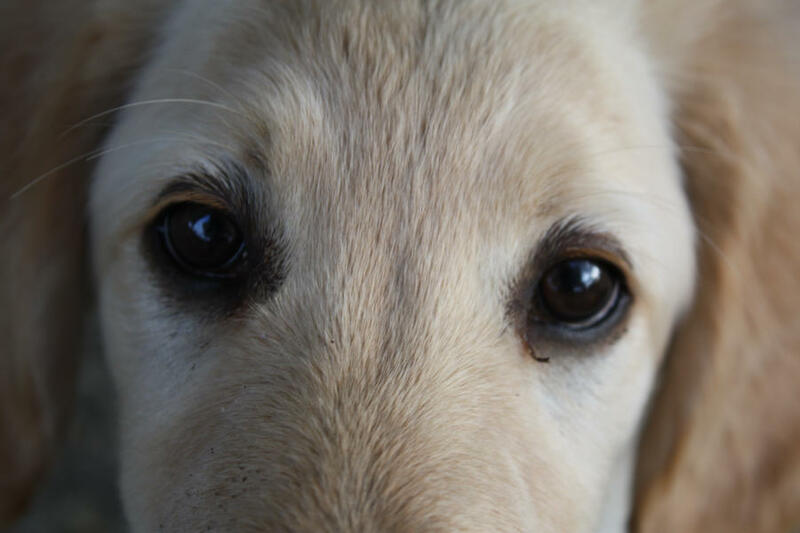 The link between gazes and eye shape has a long way to go in order to establish a firm connection, but there are already a few well-known gazes that domestic dogs use to communicate (sometimes indirectly) to humans their mood. A domestic dog can, with some limits, vary the shape and size of its eyes. Additionally, a dog can adjust the intensity and direction of its gaze. Your domesticated dog can give you clues to its mood through its eyes. A happy dog, for instance, will exhibit eye shape and size that is normal. If your dog normally has round eyes, that normal appearance indicates that your dog is happy and relaxed at the moment. If, on the other hand, your dog's eyes appear larger than normal this could be a sign of aggression. When your dog's eyes appear smaller, this is usually a sign of stress or fear. An example of an aggressive cue is when your dog stares at you out of the corner of its eye. This often serves as a sign that it is ready to aggressively defend a chew toy or bowl of food. Did you also know the direction of your dog's gaze sends messages too. Dogs will rarely gaze directly at one another because it is a sign of aggression. However, many domestic dogs will look directly at humans. The key is to decipher the different stares you might encounter. A dog that looks at you with a relaxed facial expression is likely happy and simply wants to interact with you. If, however, the dog is staring directly at you with a tense facial expression is sending a different message. This dog feels threatened or aggressive and the best way to handle that is to slowly avert your gaze. Averting your gaze shows that you have no aggression toward the animal and can help diffuse the situation.